Just days removed from his dominant, unanimous decision win over Josh Koscheck at UFC 124, UFC Welterweight Champion Georges St. Pierre has been named Sportnet’s Canadian Athlete of the Year for the third year in a row. According to the Canadian sports television network, St. Pierre edged out National Hockey League superstar Sydney Crosby in the online fan voting, which determines each year’s winner. 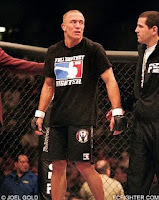 St. Pierre competed twice in 2010, scoring a UD win over Dan Hardy in March, before defeating his long time rival and fellow “Ultimate Fighter” coach Koscheck earlier this month. The 29 year-old Montreal resident has won eight straight bouts. Some of the other Canadian athletes St. Pierre surpassed in voting included baseball’s National League MVP winner Joey Votto and the NHL’s Conn Smythe Trophy winner Jonathan Toews. With the win, St. Pierre moves ahead of basketball star Steve Nash in consecutive Canadian Athlete of the Year victories, who was awarded the Sportsnet honor in 2005 and 2006.